Despite global trade fears, new investment projects and new business development around world in 2019 will continue to be tied to a country’s Gross Domestic Product (GDP) growth. Generally, the higher the annual GDP growth rate in country, the more new investment is being made in an economy. While the International Monetary Fund (IMF) believes global growth will slow a bit to about 3.7% in 2019, there remain several countries where the annual GDP growth rate will exceed 5%, including China, India, Indonesia, the Philippines and Vietnam. These high annual GDP growth countries have rapidly growing middle classes that need high growth rates to ensure there are sufficient jobs for the young consumer. Brazil – Although the recent election of new President Jair Bolsonaro is somewhat of a wild card, he is expected to push fiscal reforms during his first year signaling a very positive message to the market, attracting domestic and foreign investors. Pro-business policies are expected to stimulate the economy and generate 2.4% GDP growth in 2019, creating new opportunities for foreign brands. Canada – A GDP growth rate of 1.7% due to lower oil prices, new employment laws and regulations plus high business taxes will keep new brand investment and development down in this country in 2019. Chile – Continued strong domestic demand and solid fiscal discipline should result in a GDP growth rate of 3.4% in 2019, making Chile a solid prospect for foreign brands. India – Although higher oil costs are a drag on the economy, GDP growth is expected to exceed 7% in 2019. This is slightly down form 2018. If the government implements regulatory and economic reforms, which it has announced it will do, the business climate could improve for foreign companies in 2019. Indonesia – Strong domestic demand is expected to sustain a GDP growth rate of 5.2% in 2019. Foreign brand investment will continue due to the rapidly growing middle class consumer base. The presidential election needs watching for its impact on consumer confidence. Italy – A higher fiscal deficit and disagreement with the EU regarding the new government’s budget have resulted in an estimated GDP of 1.2% in 2019; however, American brands are popular in this market and there is a demand despite the economy’s challenges. Middle East – “The Middle East (Saudi Arabia, United Arab Emirates, Kuwait, Qatar, Oman and Bahrain), has experienced an economic contraction over the past several years with lower oil prices. Nevertheless, the restaurant segment continues to be strong. Retail is highly competitive and the B2B and B2C sectors offer limited opportunity for compelling new investment opportunities.” Paul Cairnie, CEO, World Franchise Associates. Peru – Consumer spending is up, the government is pro-business growth, and increased export growth supports a prediction of 4% GDP growth for 2019, providing a solid opportunity for new investors. Philippines – With an expected GDP growth rate of 6% in 2019, a fast-growing middle class consumer base, and a robust new investment environment, this country will continue to see continued new international brand entry this coming year. Poland – Although the country’s very strong growth is expected to moderate somewhat in 2019, the current estimate of 3.6% is one of the European Union’s highest economic growth rates. 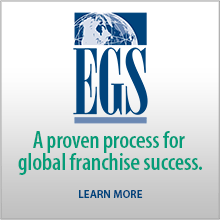 This market offers solid opportunities for foreign franchisors, but market analysis and selection of the correct partner are keys for success. Saudi Arabia – The 2019 GDP growth rate is expected to be an anemic 2% in 2019. Low oil prices, little new local investment plus fallout from recent legal issues, mean little new foreign investment in 2019. Singapore – Weaker manufacturing will be offset by stronger consumer demand, with a 2.9% GDP growth rate estimated for 2019. Anti-immigrant legislation has made finding service workers difficult and choice retail space is priced at a premium. South Africa – With a new government, the country could have an estimated GDP growth rate of 1.7% due to a program of fiscal stimulus. But security and rule of law challenges remain in a country with a huge middle class consumer upside. Spain – Although 2019 annual GDP growth is expected to slow down from 2.7% in 2018, the pace of new development should continue to be high, especially in the food and beverage sector, in 2019. Retail rents are the price level before the 2008 recession. Thailand – “As a center for global tourism, Thailand supports more international brands than its own population could support. It is also an excellent showcase of brands and proof-of-concept for the region. The Thai international brand market is crowded and tightly focused on selected urban areas. But there is a subset of strong, risk tolerant and qualified investors willing to invest in well-established American brands.” Greg Wong, Senior Commercial Officer, U.S. Commercial Service, Bangkok. United Kingdom – “The United Kingdom is open for business, but until the details of what Brexit is going to look like have been confirmed, there will continue to be uncertainty in the marketplace. There are, however, still many good opportunities for the brave!” Iain Martin, The Franchising Centre, London. Vietnam – This market continues to have strong retail sales and has benefitted from factories relocating from China. GDP growth of 6.6% is expected in 2019. 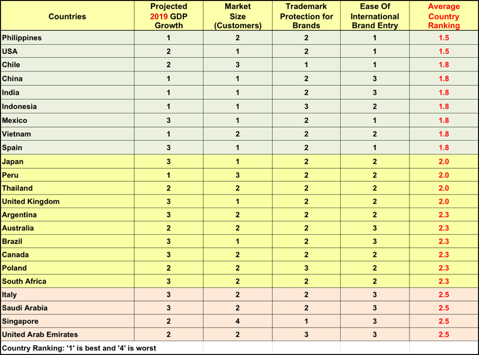 American brands are highly desired in this market. Projected 2019 GDP growth rates for this article are from the ‘Economist’ magazine. 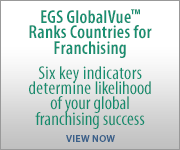 This blog is adapted from an article to appear this month in ‘Franchise Update’ magazine. Our company conducts country and regional market analysis for our clients who are considering what countries to take their business into. We tap into more than 25 international information sources and the real-time knowledge of our GlobalTeam™ members on the ground in 43 countries. Here are some snippets from our recent research in key countries at the start of the second quarter of 2018. The International Monetary Fund (IMF) predicts 3.7% global growth for 2018, the highest level in 10 years. While risks to global growth include political meltdowns, economic disasters, wars and unrest, investment risk, and intellectual property concerns, economic growth is robust in many parts of the world. Argentina – After 20+ years in the economic, exchange rate, and political wilderness, the Latin American & Caribbean Director of The Economist Intelligence Unit noted in a recent webinar that Argentina is now in a new period of extended, stable economic growth. Structural reforms, business friendly policies, less regulations, higher levels of direct foreign investment; dropping interest rates and efforts to lower the public deficit have resulted in an expected level of GDP growth of about 3% over the next few years. Brazil – For the past five years the economy has stalled, inflation has been high, and there have been numerous government and corruption problems. A recent Wall Street Journal article (March 1, 2018) stated, “Brazil’s economy returned to growth in 2017 (1.0%) after two years of contraction . . . Gross Domestic Product (GDP) increased 2.1% in the fourth quarter of 2017 from the same period a year earlier. Economist magazine expects Brazil to grow 2.6% this year and 2.8% in 2019. This will mean new investment opportunities. Peru – GDP growth is expected to be 3.9% in 2018. This has been the fastest growing economy in Latin America for many years. The government is pro new business creation because this means new and better jobs for their people. China – The Chinese consumer economy is growing at over 8% per year. The middle class is approaching 300 million people. There are 160 cities with a population of more than 1,000,000 people. In 2016, Shanghai and the two adjacent provinces had a combined GDP of that of Italy and Mexico combined. Today’s Chinese consumers want the quality, brand, convenience and service associated with Western brands. As excellent example of the spending Chinese middle class consumer is the fact that in 1990 less than 1 million Chinese took a commercial airline flight. In 2017 over 600 million Chinese flew a commercial airline flight. Indonesia – The world’s fourth most populous nation is experiencing a rapid expansion in the middle class, which includes over 30 million households. Like many other Asian countries, the middle class in Indonesia is characterized not only by their purchasing power, but also their generally higher levels of skills and education. Japan – Although Japan has an expected GDP growth rate of 1.5% in 2018, this is up considerably from past years. There has been a transformation of Japanese consumer spending patterns in recent years. Consumers are spending money on physical experiences rather than purchasing tangible goods and products. The Philippines – Growth in disposable income has resulted in a more comfortable and better lifestyle. This has contributed to the growing sophistication of consumers across age, income and gender groups. A very strong acceptance of social media allows businesses to connect with the young middle class consumer. 2017 was Europe’s strongest year of economic expansion in over a decade, with average Gross Domestic Product (GDP) growth of 2.5%. In 2018, Ireland is expected to lead the pack with GDP growth of 4.1%, with estimated growth rates of 2.4% in Germany and even 2.1% in France which is its best performance in years. While 2018 will feature a great deal of political melodrama as negotiations between the EU and United Kingdom occupy headlines, the economies of this region are moving ahead strongly and this is good news for new franchise development. Consumer confidence is the highest it has been in decades and average unemployment is at a nine-year low. Italy – The expected relatively low 2018 GDP growth rate of 1.5% is offset by increased business investment and significant household consumption. Most of the new investment in 2018 will be in the north centered around Milan. Poland – Economic growth remains strong. Rising social transfers and a booming labor market are underpinning rapid consumption growth. The unemployment rate is at a record low level, labor shortages are spreading, and there are early signs of accelerating wages. The labor market is expected to tighten further, leading to somewhat faster wage and price inflation. Spain – With 2018 GDP growth estimated at 2.7%, Spain is benefiting from a dynamic economy, record levels of tourism, rapidly declining unemployment, and domestic consumption and new business investment. United Arab Emirates – The International Monetary Fund (IMF) expects GDP to recover from recent oil and gas price woes to grow at 3.4% in 2018. The UAE has three major consumer types: (1) the local Emiratis (about 400,000); the ex-pat foreigners who work at the regional headquarters of international companies; and the high number of tourists who come to the UAE because it is a regional vacation and shopping opportunity. India – This country is set to be the fastest growing economy in the world again in 2018. The World Bank says India’s growth is expected to be over 7% in 2018, overtaking China. The World Bank believes strong private consumption and services are expected to continue to support economic activity. Exports for the last month that data is available rose 30% year over year. The Purchasing Managers’ Index expanded the fastest it has in five years. At least one international ratings agency has upgraded India’s credit rating. For further information on how we might help your company realize its full global potential, contact William Edwards on +1 949 224 3896 or at bedwards@edwardsglobal.com.